Don’t forget that it’s Mother’s day this Sunday, and if you’re wondering what you can buy for the main woman in your life, skin care products are a fantastic option. There are only so many bunches of flowers and bottles of perfume that you can buy for your mum until you feel as though you’re not putting much of an effort in, so why not spoil her with some fab products that she’ll be able to use all year round?! Dermalogica have some fantastic anti-aging products that are sure to be gratefully received. 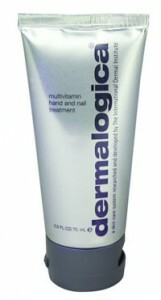 Dermalogica Multivitamin Power Firm is an amazing product that is suitable for use around the eyes and lips. Designed to diminish the appearance of fine lines, it really can help to give skin a new lease of life. Everyone can use a good hand cream, and Dermalogica Multivitamin Hand & Nail Treatment is great for mums whose hands may need a little TLC after washing the dishes once too often! Not only does this treatment help to rehydrate dry hands, it can also help to strengthen nails- making it a great all rounder. Give your mum something to really smile about this Mother’s Day and treat her to some fantastic pampering products.